[T]his integrated approach enhances scientific thinking and conceptual development in science, teaches forms of expository writing that are vitally important for elementary students to learn, and promotes academic language development for all students, including English language learners. 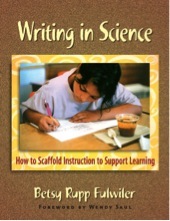 Furthermore, the [Writing-in-Science] Approach's practices of science and scientific literacy are consistent with the NRC Framework for K-12 Science Education and can help support implementation of the Next Generation Science Standards. 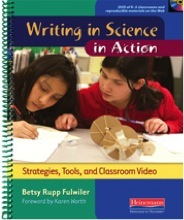 Importantly, two publications by Fulwiler—Writing in Science: How to Scaffold Instruction to Support Learning (2007) and Writing in Science in Action: Strategies, Tools, and Classroom Video (2011)—make the theory and practices of the approach accessible across the nation and internationally. Of particular note, state science assessment scores in a three-year period increased from 42% student proficiency to 74% proficiency and then to 86% in one pilot elementary school. © 2014 by Betsy Rupp Fulwiler. All rights reserved.